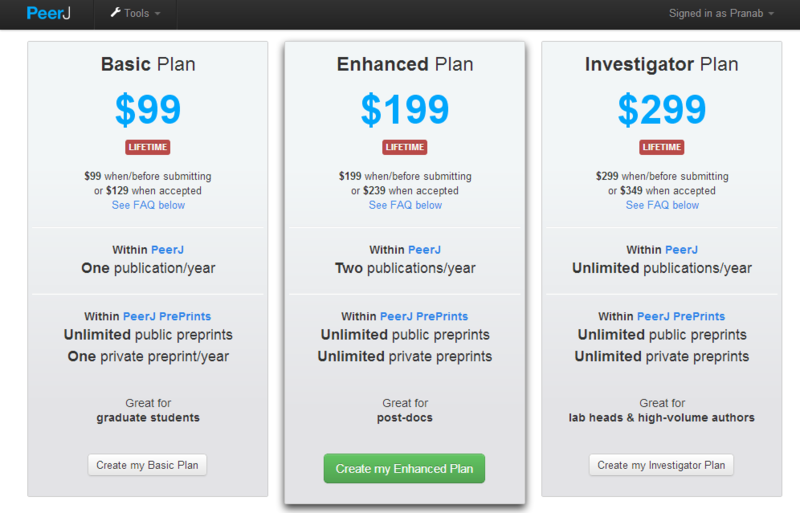 I have been very excited about PeerJ ever since Peter Binfield took up the challenge of bringing down the costs of publication in an online, open access environment a few months ago. I wrote about it, expressed my skepticism at the “starting at 99$” tag, but nonetheless, was fascinated by the audacious claim of bringing lifetime publishing at just 99 bucks! I duly signed up for their email updates and yesterday I received an email informing me that PeerJ was up and running, and would be opening to authors who want to submit papers to them from 3rd December, 2012. The first publications are expected to come out by the end of January 2013. Each of the authors of a paper have to be a paid member, except for the papers with more than 12 authors, where just 12 have to be paid members. The rest can be free members. The paid members commit to reviewing at least one paper each year as a symbol of their “giving back to the community”, breaching which may lead to suspension of their account which needs to be reactivated with another payment. The journal accepts only original research articles from the biological and medical sciences. The formidable group of editors, the reputation of the founders and the uniqueness of the endeavor has given it a great momentum going into the inauguration of the journal. I must say few journals have launched with so many eyeballs trained on them! Mike Taylor at SVPOW (Sauropod vertebra picture of the week) almost jumps with joy, saying that this might be the single best gift a journal can give to its authors, and though not as ecstatic, I tend to agree with him, especially since the PeerJ seems to employ the “Name.Year” style with an alphabetized reference list. This is always a lot more work than the simple and robust, ordered Vancouver style. I personally faced a lot of problems writing for (and then, recently reviewing a paper) a journal that staidly stands by this structure. Thankfully, my University endorses the Vancouver Style for thesis writing, which should make my life much easier. Anyways. PeerJ is off the blocks. And since I do not have anything going on research-wise that I can put up here (also, I am kind of broke), I shall hold off on getting the membership – I do not want the year to run out without me at least submitting paper for their consideration! The problem I personally see happening is that since most of my co-authors would be residents like me (or medical students), they would not want to part with the 99$ subscription fees, since, honestly speaking, though it is not a big amount in the US or UK, it is a significant amount of money in the Indian context, especially with the rupee-dollar tug of war being pretty one-sided. However, this once-a-lifetime offer is indeed a revolutionary idea. I wonder how things shall shape up once it gets PubMed/Medline indexed and rakes in a good Impact Factor and starts to get some visibility in the academic populations from the developing world, who work with severe monetary constraints that cam prevent publication in the bigger journals owing to their huge processing fees. A disruptive innovation has been introduced… Peter Binfield has done it again… now one just needs to sit back and watch as the drama unfolds, and see how this radical effort impacts the medical (and scientific) publication business in general. Tags: OA, Open Access, PeerJ, postaday, Public Health, Publications. Bookmark the permalink. Thanks for the nice commentary Pranab. We are also excited about the launch and the reception we are getting! Just to be clear though, you are giving me way too much credit! There are two co-Founders – myself and Jason Hoyt (ex-Mendeley) – and Jason deserves all credit for coming up with the original idea, making the company a reality, and running the development effort to get the (amazing) functionality off the ground! Thanks for dropping by and caring to comment. Yes. I apologize for overlooking Jason’s contribution (especially since Mendeley is a service we all love, and he was a part of it! 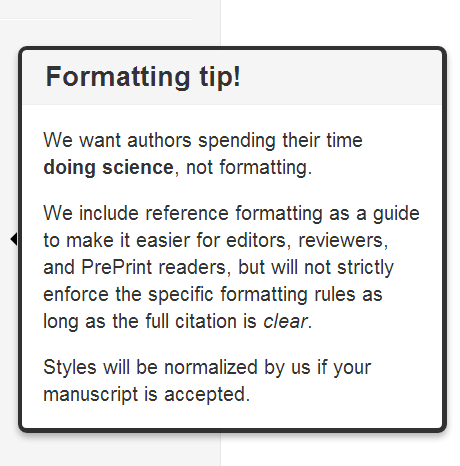 ), but I guess I have personally been a little biased by your leaving PLoS ONE to jump-start PeerJ! Kudos to the whole of the PeerJ team! I am waiting for end-January with bated breath!